Steven Naismith has signed a three-year contract extension at Everton, which will keep him at the club until 2019. The 28-year-old Scotland international joined the Toffees on a free transfer in 2012, signing an initial four-year deal. The former Rangers and Kilmarnock forward has six goals this season and scored on Monday evening when the Toffees beat QPR 3-1 at Goodison Park. 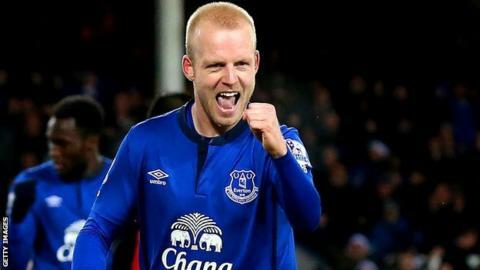 "I am so happy here," Naismith told the club's television channel. "From the moment I signed my first contract here it wasn't long before I saw what a great club it was. "I would say this is probably the best form of my career. I'm delighted to have agreed an extension which will keep me here for a few more years yet." Makes professional debut for Kilmarnock in 2004, wins young player of the year awards from Scottish Football Writers in 2006 and Scottish PFA in 2007. Joins Rangers in August 2007 for £1.9m, scoring 33 goals in 140 appearances for the Glasgow giants, wins six trophies. Moves to Everton on a free transfer in July 2012, comes off bench 20 times in difficult first season. Breaks into Roberto Martinez's first team in early 2014 and becomes a key player; now has 18 goals in 85 appearances. Has 34 caps for Scotland, usually as attacking midfielder, with four international goals, all in qualifying matches. Read more on Steven Naismith: The people's footballer or disowned Ranger?